A number of industries have already begun to implement VR to provide new experiences for their customers. Virtual Reality has come a long way since the early 1960s when Morton Heilig built his 3D video machine - the Sensorama Simulator - which allowed you to ride a virtual motorbike while experiencing the sounds, winds, vibrations and even smells of being on the road. 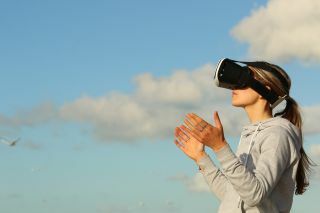 Fast forward to the present day, and Virtual Reality is actively used in a wide variety of fields from media, entertainment and medicine to aviation and military training. And VR will become increasingly accessible and affordable with a simple swipe of VR enabled smartphones. The reality is that mobile devices – not games consoles, laptops nor smart TVs – will make immersive VR mainstream. From tourism and virtual classrooms to corporate training and company events, there is a huge market opportunity for organisations to boost engagement with video-based, mobile VR content. Tourism: Travel is one of the most common use cases for VR video today and while relatively well-established, there’s a lot of room for growth in the industry. Tourist boards along with hotel chains and online booking agencies across the globe are starting to create experiences aimed at attracting visitors. Likewise, museums are getting in on the act, including the British Museum which has recently launched VR tours of the galleries of ancient Egyptian and Assyrian sculpture and Egyptian mummies. Entertainment: Without a doubt, theatre represents a huge opportunity for this technology. Sitting in a virtual front-row seat is a much more engaging, immersive experience than watching a TV screen. The company Disney On Broadway recently used the power of VR to promote the Lion King, the biggest grossing Broadway production of all-time. So far, the experience has attracted over 1.6 million views on YouTube. It’s easy to forsee how a VR app showing, for example, the opening numbers of musicals, would delight seasoned theatre lovers and engage new audiences and create more opportunities for selling tickets, merchandise or VOD viewing. Sport: Live events such as the FIFA World Cup qualifiers are obvious targets. By using traditional broadcast supplemented with VR content, it is possible to virtually transport football fans to the best seats in the stadium. As well as delivering a highly engaging experience, this service can also be monetised. In addition to advertising, brands get the opportunity to sponsor the VR live stream or recorded show. Plus service providers can choose to add a VR event as a freemium tier or as a standalone pay-per-view for live events. Health: VR has the potential to be a game changer in the medical industry. Take the work of Professor Daniel Freeman from the University of Oxford, who, together with the writer Jason Freeman, has recently completed an overview of how VR is being used to treat mental illness. Because of VR’s ability to create powerful simulations, any scenario in which psychological difficulties occur can be recreated. The in-situ coaching that’s effective for so many disorders can now be delivered in the consulting room, with the simulations graded in difficulty and repeated as often as necessary. For example, a client with a fear of flying can be helped to overcome their anxieties in a virtual aircraft. Immersive training experiences. In a similar vein, Mobile VR video is especially useful for immersive training experiences, where trainees need to learn how to prioritise in a complex environment – for example, triage. In a 360-degree view the trainees are not able to view the entire visual frame at any one time, which makes it harder for them to make smart decisions at speed. They have to look around the virtual environment and decide whom to help first. This is a far more effective training tool than flat video because it engages more parts of the brain, making it more realistic. Onboarding new recruits: In today’s competitive higher education market, 360-degree video can provide universities with a powerful marketing, recruitment and admissions tool to bring the campus to life. Similarly, for large companies with a distributed global workforce, new recruits can integrate faster by having access to a 360-degree view of offices from their VR-enabled handset. Using any video format - 2D, 3D, 180 or360 degree - organisations can create engaging live and VOD viewing experiences for users to watch on their mobile phones. Many of these VR experiences simply offer traditional 2D video inside a virtual lounge, theatre, stadium or classroom. This approach adds an immersive twist to the viewing of standard 2D content and also has the advantage of being bandwidth and device friendly. Immersive 360 video goes one step further and places the viewer inside the content. But as 360 video has the downside of draining mobile batteries fast and can possibly lead to overheating, the best way is to combine 2D and 360-degree content. For VOD scenarios - for example learning about Ancient Egypt at school - pupils can be teleported into a future classroom environment and watch a traditional 2D educational video and then delve into a short 360 video to explore the secret chambers full of hieroglyphics and treasures in King Tutankhamun’s tomb. Similarly, for live events mobile VR viewers can sit in virtual front-row seats to watch the traditional 2D broadcast and then have the chance to go behind-the-scenesvia a 360 video feed. The simplest approach to create mobile VR video experiences is building a VR app – either in-house or with a specialist VR app developer - that wraps a 3D screening room around traditional 2D content. Standard 2D post-processing and distribution tools are used, removing the requirement to learn or purchase new tools. The next level is to incorporate 360 video. Here, effective planning is key to success. The 360 cameras need to be positioned in the correct place prior to filming - usually in the centre of the frame or scene. It’s also important to plan ahead of time how you will guide the user and let them know where to look next – for example, by using sound or special effects. With 360 video, the different frames need to be stitched together. Some cameras stitch the frames while recording, while others require this to be done in post-production. Ideally this should be done locally prior to uploading the file to the distribution platform. For easy mobile viewing, the content needs to be added to a mobile VR application. Incorporating live 360 video is the most challenging option. Although this is actually less of a planning headache than VOD because it’s often clear where 360 cameras need to be placed to capture a sports event, live concert or global consumer product launch: halfway along the football pitch or right in front of the stage. This gives viewers the ability to look right and left and capture all the action as it happens. It’s in the processing and distribution of 360 video where the main challenges arise. First, the frames need to be stitched together and transcoded in real time, which requires lots of computing power. And then the content ideally needs to be pushed to the cloud in 4K, which requires considerable bandwidth and scalability, as well as a robust uplink. Currently, using a laptop with a VR device is preferable for viewing live 360 video as it rapidly drains mobile batteries but, it’s just a matter of time before we jump over this technological hurdle. With sales of affordable headsets such as Samsung Gear VR and Google Daydream growing steadily, the virtual floodgates are about to open. As we break down potential bottlenecks around creating, hosting, delivering and consuming VR content, usage will grow exponentially - and we’ll see forward thinking organisations immersing customers and employees alike with new mobile VR applications and use cases. In virtual reality, the only limit is pure imagination.